Set in the stunningly rugged scenery adjoining the World Heritage-listed Blue Mountains, Emirates One&Only Wolgan Valley is three hours drive from Sydney, with its closest township being Lithgow, 35 kilometres to the south. This unique spa resort is built around a fully restored homestead and offers luxury free standing villas surrounded by private nature reserve. Conveniently close to major attractions such as the Zig Zag Railway, Three Sisters and Wentworth Falls, Fairmont Resort Blue Mountains MGallery by Sofitel offers luxury accommodation surrounded by the World Heritage listed Blue Mountains and Jamison Valley, just 90 minutes from Sydney. Set on three acres of lush, landscaped gardens, Leisure Inn Spires offers luxury accommodation in the charming Blue Mountains village of Leura, just an hour and half from Sydney. Close to the Three Sisters, Katoomba Scenic Railway and a range of popular natural attractions, the hotel is the ideal escape. 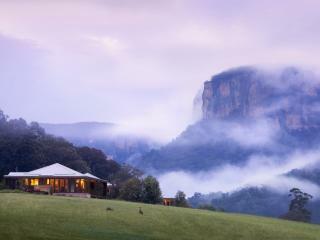 Offering award winning accommodation in one of New South Wales' best country hotels, Lilianfels Blue Mountains Resort & Spa enjoys a stunning natural location surrounded by natural beauty and attractions close to a range of leisure pursuits including bushwalking, fishing and canoeing. Situated in four and a half acres of lush landscaped gardens, Waldorf Leura Gardens Resort offers luxury accommodation and plenty of country hospitality. Boasting a fantastic range of onsite facilities, the resort is close to natural attractions such as Katoomba, Scenic World and The Three Sisters as well as an 18-hole golf course and nature based activities.